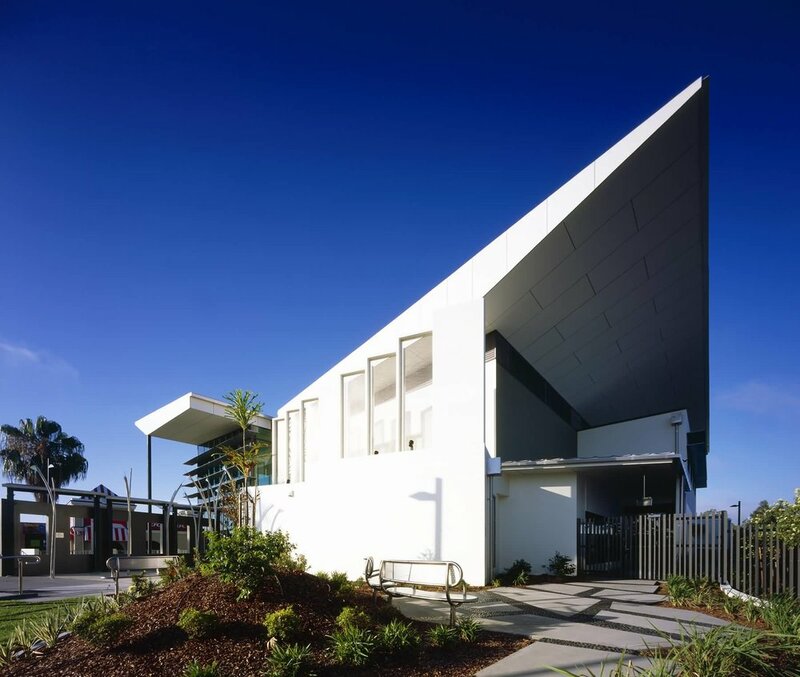 After the successful completion of the Caloundra Courthouse and Watch House, Guymer Bailey Landscape and Guymer Bailey Architects were commissioned by the Department of Justice and the Attorney General (DJAG) to design the Pine Rivers Courthouse and Watch House located on a challenging site in the commercial hub of Strathpine. An existing storm water canal that ran through the site influenced much of the site planning and also motivated our value-adding decision to partially cover the canal with an entry podium. In keeping with the DJAG’s philosophy of accessible, transparent and open justice facilities, the main entrance has been defined by a front promenade that provides a prominent sense of arrival. Key to this is the sculptural representation that features stainless steel poles with tips of dicoic glass that dance through the entry pavement to represent the reeds found in a creek bed that once flowed through the site. Polished black pebbles have been set in the pavement in fluid shapes to represent the water of the creek. Other outdoor spaces surrounding the courthouse provide private gardens populated with native plants that provide a welcoming place of retreat from the proceedings taking place inside.